Legend has it that Moses Carter who lived in the village of Histon in Cambridgeshire at the beginning of the 19th century was seven feet tall. He is reputed to have carried a small boulder from a building site to a local pub where it remains to this day. The Taste the Cracklin Hog Roast Histon team think that a man of his stature would fully appreciate the good, wholesome, no nonsense food they produce! Using our custom designed ovens, we can cook the most delicious spit roasted pork which just falls of the bone and melts in the mouth. We are also sure he, like everyone we have cooked for would fall instantly in love with our warm herby stuffing and fresh apple sauce. It was certainly true that the rowdy football ball club whose annual dinner we catered a while back, felt the same way. Although the Hog Roast Histon caterers love to cook hog roasts anywhere and everywhere, this event was a formal sit down meal. We especially enjoy these formal functions as they give us the chance to really show case our talents: not just our exquisite food, but our organisation and planning skills. 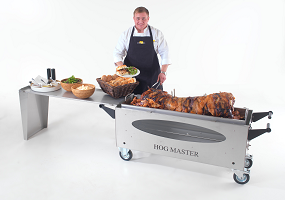 One of the things the Hog Roast Histon team really prides itself on is flexibility in the delivery of service: we recommended one of our extensive menus to the football club which they were very happy with, with just a few minor tweaks. However had they asked us to create a bespoke menu for their evening we would have been happy to do so. All our accompanying dishes are cooked on site on the day so you can rest assured they will be served to you fresh and not simply heated in a microwave. We prepare a variety of tasty salads with delicious dressings and roasted vegetable if required. We also have a choice of stunning desserts for you to choose from. Being able to create such a variety of foods and meats (along with the traditional spit roasted pig, we can also roast whole lambs or large joints of beef) is due to our amazing oven which not only comes with several attachments for the different types of meat, but which can also transform into a barbecue for kebabs or a rotisserie for chickens and turkeys. The bottom of the oven is an excellent place to keep prepared warm food until they are served without them becoming overcooked and dry. And because of our special gas powered system which works thermostatically, we can roast indoors and the only smell being generated will be that of sumptuous roasting meat and stuffing, which we think will guarantee your guests big appetites! The football club were certainly very pleased with the meal we catered for them. They particularly enjoyed the spectacle of seeing the meat rotating and cooking right before their eyes. And we were able to discretely clear away all our equipment at the end of the evening leaving the venue clean and tidy.